There have been a few sales around the web this week that can save you some decent cash on a variety of Samsung’s convertible Chromebook lineup but this deal is hands-down the best of what’s around. The Chromebook Plus V2 has expanded Samsung’s Chrome OS resume to the point that you have to wonder if they’re even pursuing a next-generation device at the moment. Still, the current lineup is nothing to sneeze at and the latest deal can save you $150 while scoring you a portable 500GB SSD at no extra charge. This particular deal comes directly from Samsung and gets you the Intel Celeron 3965Y, 4GB of RAM and the larger, 64GB of storage. Don’t forget, you’ll also be getting that built-in Samsung Pen that’s great for note-taking, sketching and even grabbing screenshots. Unlike the original Plus, the V2 is equipped with two cameras. The front camera is a modest 1MP but the “world-facing” rear shooter is an impressive 13MP with autofocus capability. 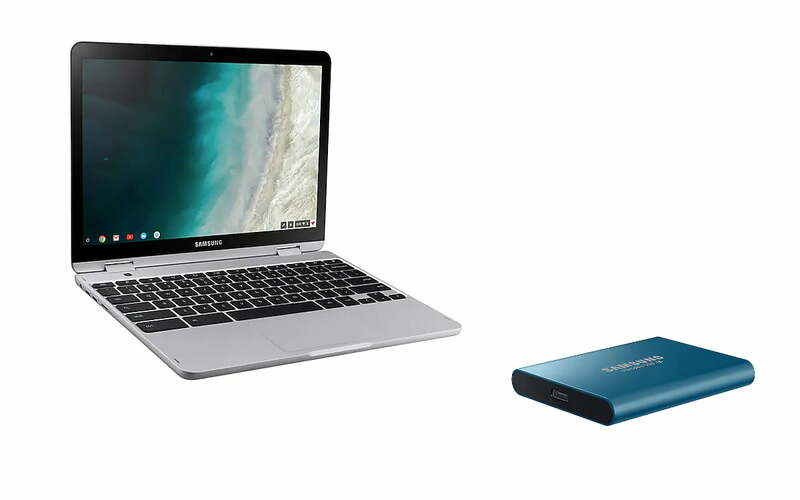 Normally priced at $549, the 64GB Chromebook Plus V2 can be yours for a cool $399.99 and Samsung will throw in the T5 500GB portable SSD for free. Simply add it to your cart and the discount will be applied at checkout. That adds up to a savings of $280 and that’s awesome. We saw this deal a couple of times last week but it seemed to be intermittent with Samsung changing the discount and/or the freebie multiple times. So, if you were looking to pick this one up, I wouldn’t waste any time.